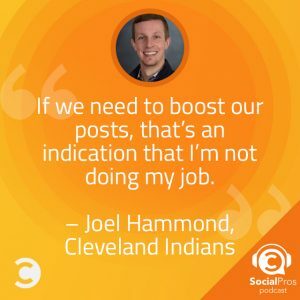 Joel Hammond, Assistant Director of Communications and Head of Social Media for the Cleveland Indians, joins the Social Pros Podcast to discuss how a lean team can shine the spotlight on their fans across multiple channels with minimal paid boosts. With over 150 games in a single season (not including playoffs), managing the social calendar for an MLB team like the Cleveland Indians is a nonstop grind. Instead of becoming worn down by the never-ending schedule of games, Joel has found an approach that harnesses the thrill of the game while maintaining a meaningful connection with fans. 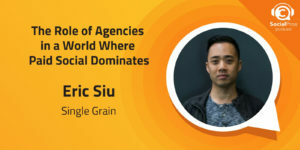 Establishing a marketing team structure that provides direction while staying flexible allows the brand to react in near-real time to game outcomes as they develop. This way even the smallest of social teams can make a significant impact on brand relevance in a competitive field. When the heat is turned up, and the spotlight is focused on his brand, instead of panicking, Joel sees it as an opportunity to show off his team’s skills and creativity. Keeping each platform’s content unique ensures fans don’t get bored and stay tuned in to each account. He even takes it one step further by engaging directly with fans on their accounts which helps keep the conversation going and earns valuable peer buy-in for the Indians brand. Not voting for our players is a crime. Develop advocates for your company, your brand, and your team. Set goals, listen to your customers, develop a voice, and stick to it. LeBron James. He’s a great basketball player but also a great business and social media mogul. 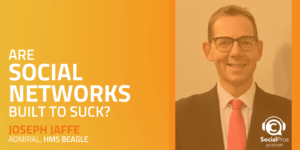 He’s developed a huge base of advocates for all of his products and Joel would love to pick his brain on how he got to where he is business-wise and what lessons can we take from that. Jay: Welcome everybody to Social Pros, the Podcast for real people doing real work in social media. I am, as always, Jay Baer, founder of Convince & Convert. Joined as usual by my special Texas friend, he is the executive strategist of Salesforce Marketing Cloud, the man on the microphone, Mr. Adam Brown. Adam: Jay, it is great to be here. Thank you for having me as we continue this journey onto social media knowledge, insight, and theory. Jay: That's pretty great. Joel, welcome to the show. Joel: Thanks for having me guys. What an intro! I could get used to this, geez. Jay: Okay, you can just be on every time. Anytime Adam is sick, you can be the fill-in host. That would be spectacular. We've only had one other baseball person on this show. And this might have pre-dated Adam. We have Brian from the Giants on a couple of years ago and it was a great episode. I imagine you know him, or know of him. You guys all operate in the same baseball social media circle. Joel: Brian is awesome and the Giants do great work. So I am humbled to be a follower of his. Jay: Well being in Silicon Valley and those environs, if the Giants aren't good at social media they have a real problem. You got to sort of get it together. One of the things that I want to make sure our listeners understand, is that in addition to running social media for the team, which is not an insignificant gig, which we'll talk about here in a minute. You also coordinate and oversee the TV, the radio, and all the community relations work for the team. And if I have this correct, it is my understanding that your "department" is you plus two interns. Joel: That's our social media team so we ... It's funny, we go to major league baseball advanced media meetings every off season, and every time I go to this meeting, every other team seems to have added a full-time staff member. And here I am it's just me and back home are my two interns. It's a great job, it's a demanding job. And when we hire my colleagues just, that's on the social side, so when we hire then we tell them straight up from the jump, "You will be paid like an intern and you will be worked like a full-time staff member." So our goal is to have that group leave big imprints on our department and on our organization. So my former interns now work at Tampa Bay Rays and big agencies here in Cleveland and my intern from last year now works for the Phillies. So we've got a pretty good branch out in the social media space. That's right. Adam: It's a social media farm team. Joel: Our organization generally is known for having a lot of Indians-trained baseball operations staff members at other clubs. And now we're hopefully extending that tree out in the social space. Jay: Very nice, it's your own coaching tree. I love it. But that is a lean team, I think that's true. So how do you do that? It sounds like, A, you are not just managing, you personally are doing a lot of social as well. And I always find it fascinating when we talk to guests on the program who work in professional sports, clearly most of where people get real excited is at night and in some cases later at night. So your schedule must but wacky! Joel: We're lucky in that while it's just kind of the three of us that have our hands kind of dirty in the day-to-day. We've got a great support team internally with great photographers, who give us great content. And also a great production team, which gives us all kinds of great video content and gifts and that sort of thing. So a larger, indirect team contributes and then as far as schedule goes ... and how do we do it? I mean, it's demanding. I think anybody who is in our roles with baseball, pro sports, basketball, hockey, it's a demanding job. I call it a 20 hour a day job. I truly shut down from 1-5 a.m., you know that sort of thing. Or we take turns in shutting down from 11 p.m. to 5 a.m. and I'm usually up early so that's my first stop in the morning. It's a very difficult job but also can be very rewarding. Jay: Now that it's the off season for your team at least, unfortunately, as we record this, the World Series is in after the second game. Does it get a little easier now in the off season? You're not creating as much content, of course, until pitchers and catchers report and things like that. You're still obviously participating in doing things in signs, signings, and managerial changes and all those kinds of things. But not at the same kind of pace. Joel: Yeah the pace has slowed down, thankfully. So we take this time to catch our breaths a little bit. Like you said Jay, before we came on, unfortunately a little earlier than last year so. Last year was crazy, right? And I know Kevin from the Cubs had it worse than me because they went through a parade and all kinds of stuff until Christmas. But last year was crazy, our off season was cut short by a month. This year's a little quieter and, of course, our fans are fired up and disappointed just like we are at the early exit. So, you know, we've quieted down a little bit. Our pace on social has slowed down a little bit, just because our fans who are extremely passionate, have many objections to how the season ended. So we've quieted down and given them a break a little bit but we're starting to ramp up now. It's award seasons and we just had four guys become finalists for Gold Gloves. So, we'll ramp back up here as we go in the next couple weeks. And then we announce our Tribe Fest in January and we announce our tickets on sales and then we got straight to Tribe Fest in January. So it slows down for a little while, good to catch your breath. But before long it picks back up very quickly. Jay: From an editorial calendar standpoint, do you have a regularly scheduled social cadence that you try and stick to? So, on game days we do some interaction things, and then at 9 o'clock we kind of do this, and at 11 o'clock we do starting line-ups, and then at 3:30 we kind of tease this. Do you sort of have a structure that you try and fit into each of the games? Does that change home versus road? How do you kind of feel what to post and when? Joel: That's a great question. So we have a general idea of how a day will go, but it's all dependent upon what happens the night before. People ask me that all the time, "How far do you plan out? How far do you schedule?" Well, we treat the next day differently if we win our 22nd straight game the night before, or if we lose 10 to nothing or if we've lost 4 straight. Game days typically go in the same fashion, mornings are recapping the night before, promotional posts for that night's game if we're at home, promotional posts for an upcoming home [inaudible 00:09:47] if we're on the road. And then usually right around 3 o'clock in the afternoon, for a normal 7 p.m. game time, we shift into game mode. So we go, line-up, uniforms, which our fans eat up. And then we go batting practice content and then you know, pre-game it's fan shots. And then we're right into game. So, usually up till 3 p.m. can vary based upon what we did the night before. But once that game mode kicks in is when we really sort of have our plan mapped out to a certain extent. We're always dependent upon what happens in the game, but the structure can remain somewhat the same. Jay: You had teased there a moment ago, couple months ago you set the all-time American League Record for most consecutive wins, which is remarkable. And several of those wins were in improbable fashion. It was truly a spectacular, something that nobody will forget. Any baseball fan will recall for years, and years, and years, and especially Tribe fans will recall it forever. It will be part of the urban legend, the lore of the team, which was already considerable. That must have just been crazy to be part of, number one. And number two, how does something like that accelerate fan enthusiasm and sort of propel social engagement and effectiveness? It just probably kind of takes on a life of its own doesn't it? Joel: It absolutely does. It was awesome. You can't see me, I'm giggling. It was fun. It was fun, it was enthralling, it was, you wanted to come to the ballpark to work. Rewind a year, we set our club record last year with 14 straight wins from, I think it was, mid-June to July 1st. We won 14 straight games. On our way, of course, to the World Series. So that was crazy and we had fun with that. Well, this year we didn't start off all that great. We were kind of trashing about for the first two, two and a half months of the season. And then, even in August we were kind of inconsistent and then that streak begins. I challenged team to look at it as, "This is an opportunity for us to showcase our talent." So, just like last year, where our run to the World Series in game seven, I really looked at that as an opportunity for us to showoff, right? What can we do to take advantage of this? This only comes to ... we're lucky, a lot of teams don't have these opportunities, so how do we showcase our talent, our team, our organization. And that's what I challenged my team to do this year as well. How do we get creative? How do we have fun with this? And so we changed our AVI, we had a new GIF, a count up GIF, using our team's uniform numbers up to 22. We just did all kinds of crazy stuff and, like you said, our engagement numbers were off the charts during that spell. Hopefully we don't count on that again next year, but it was a crazy stretch. Jay: Well, speaking of which, the Indians are number one in all of Major League Baseball, in social media engagement rate, interaction rate. So congratulations on that. That is pretty remarkable, to be first in the league. Considering how many really strong social media teams there are working for these clubs. That's really a feather in your cap and your team as well. Joel: Yeah, thank you. So we're number on in a few metrics, I think I told you. We have some room to improve on a Facebook, on that platform. But, it goes to show that ... I think it goes to our commitment to it. It's hard, like I mentioned, it's hard to be on everyday on all platforms, all hours of the day. Hopefully that those numbers are reflective of the commitment that our team has to those platforms. Jay: How important is paid for your social program? Are you putting promotional budget behind your stuff? Are you boosting things? Are you doing paid Instagram and all those kind of things? Or do you just sort of have this such a treasure trove of fans because of the nature of the work you do and success you've had in the past, that you don't have to do as much on the paid side? Joel: No, it's minimal and it's funny but I don't ... Our marketing team, we're saddled a little bit differently, or structured a little bit differently I should say, where our marketing and brand team handles media buys and paid social. They, of course, let me know what's happening. But the way I look at it is, is if we need to boost our post or do sponsored social, to me that's an indication that I'm not doing my job good enough. It's always funny, I go talk to groups that include small businesses and it's hard for me to relate because I know how important paid social is to those folks, to get their accounts and brands out there. To me, with our follower-base and our fans, our fans are our customers, right? Our customer's passion for our team ... if we're relying a ton on paid social, then to me I'm not doing my job good enough. So, we do a little bit of it to promote home stands and in the off season we'll promote six-packs and Tribe Fest and that sort of stuff. But we do not do a ton of paid social. Hopefully we're getting smarter about that ... and I know there was news this week that Facebook is testing out a separate feed for brands and that sort of stuff. Based on the landscape and what happens from there we might have to change our focus there. But, for now, we do not focus all our efforts in that area. Jay: We said that you're number one in interaction rate in Major League Baseball, and you know, there's a limited number of teams, there's a limited number of people who do what you do. It's like being a quarterback, right? Or being a starting catcher, there's only a few of those jobs in the world. How much competitive analysis do you and your team do? Are you always looking to see what other clubs are doing or just sort of occasionally? Obviously you get reports, probably from Major League Baseball Advanced Media, that talks about, kind of comparing and contrasting club metrics. But are you looking at their content streams and saying, "Oh those guys are doing it well." Or is it only when you're playing those teams, then you're sort of interacting on Twitter et cetera? Joel: No, we study what teams do across league. So, I think I mentioned when we spoke via email before we came on about teams that I admire and teams that do things right. We look at teams all the time on what their doing well, what their not doing well, what we can improve. We have platforms where, like Facebook, where we can improve. So, what are the teams that are really succeeding on Facebook doing? Facebook is a little ... what the heck succeeds on Facebook? So, we study those teams and what are they doing that, are they posting less frequently? Are they posting more frequently? Are they just posting video? Are they just doing sponsored social with partners? Or whatever. We ... sorry, I think we cut off there. But, we study all the time. We look at where we stand. I think a lot of ... if you gave truth serum to a lot of my counterparts on other teams, I think everybody's always looking at what other teams are doing. What's doing well, what's not doing well. There's a lot of eyeballs on teams throughout any other leagues. Jay: If there was a team, or a league, or a sport that you could do social for if it wasn't the Indians and Major League Baseball, what would it be? Joel: If there was a team that I would join if I wasn't with the Indians? Is that what you said Jay? Jay: Yeah, either in baseball or something else. Would you go do social for the PGA Tour as Lauren Teague who works on our team at Convince & Convert used to do. Is there something else that you're like, "You know what, that would be really cool to try that on for a while." Adam: Ohio State, right? You need Ohio State, 14 games. Adam: It'd be like stealing. Joel: Exactly. That's not to ... if my counterparts in the Browns just so happen to listen, I know they do great work. Not to diminish what any team, or what any NFL team does. But 16 actual game days I think would be a fun thing to try. Jay: I think you guys should do a job share here. Call them up and the Calves guys too. Just rotate it around. It'd be great. Adam: Joel, I'm going to go back to one of the things that you and Jay were speaking about. I think one of the interesting things about a baseball game, and how you market it is, in a way you're a bit doing event marketing. And one of the great things about event marketing is the fact that you have a lot of people who are talking about the event in real time. One of those people being, of course, the opposing team. Now, you mentioned a little bit of the back-and-forth and whether or not MLB is giving you any suggestions or things like. But I was curious if there is any kind of prep or any discussions with the opposing team, recognizing that they're going to be sending a lot of the same tweets in or around the same time. And I'm also curious if whether you're finding that your followers are following your social handles, or are they following kind of hashtags, or both, when they're kind of watching and participating in the event in real time. Joel: Yeah, great question. There are certain teams in our sport that we interact with more. In game to me there's not a ton of interaction with the team we're playing. Exceptions to that would be during the World Series last year. We had a ton of interaction with the Cubs because I know their social staff and they're good at what they do. And we knew that we could interact with them in a fun way, maybe take some jabs at each other but not like go overboard and have hard feelings and that sort of thing. But generally, unless we would plan something out or something extraordinary happens, we would not interact with other teams too much during the actual game. We might do something leading up to the game or postgame or whatever. We're good friends with the Rockies because we participated in MLB's Final Vote campaign in 2014 with them, so when we played them this summer, I had a lot of fun with them. But for the most part, in game there's not a ton of interaction. We're more focused on keeping our eyes on our fans and what they're talking about and sharing their content. You mentioned, Adam, that one of the great parts of doing that, and I agree, it's a way to market your event. What we do, we share, a lot of teams don't do this, we share our fans content as much as we can. Because, the way I look at it is, if we are marketing an event, I could tell you that an Indians game at Progressive Field is fun until I'm blue in the face. But the chance of a fan believing me is less than a fan believing one of their peers, who's at the game, who says this game is fun. So, in game, during the event, we're more invested in seeing what our fans are talking about. What they find enjoyable about the game and sharing their content. Adam: It's the equivalent of being on the jumbotron at the game, is having your tweet or post re-tweeted or shared on a social platform by that actual team. I can only imagine the enthusiasm of having that take place. Jay: Okay, okay, I'll follow the account, Jesus. Joel: Geez, hit that follow button, Jay! Come on. Adam: I'm on it, I'm on it. Jay: And that's why I say we're always on. I don't want to miss opportunity to connect with a fan and I think the results speak for themselves. Adam: To that point, and the fact that you have all of these fans, and consumers, if you will, that are sharing information and their enthusiasm for the team. I know a lot of the customers that I speak with at Salesforce are using social listening almost as real-time R&D. To find out, okay what are people most excited about? What aspects of our product are people most excited about? And I'm curious if in Major League Baseball, you have started to kind of do the same thing? Wherein you're using social listening insights to understand, okay, what's the sentiment about a particular player? What is someone saying about this player in AA or AAA that maybe influence the enthusiasm that player may bring to the team if we make the call out. Is there any type of data or insights that your team is sharing with the other aspects of the front office? Joel: We don't listen as far as players go. What we do as far as player sentiment, or player connection, is we do a vast amount of surveying through our marketing department and our brand department, on that aspect of it. So any sort of promotional items that feature payers, generally those decisions are informed by surveys of our fans, not social. Now, we can tell our marketing team anecdotally that, "Oh, somebody is more connected to Jason Kipnis than they are to Austin Jackson." That's probably a bad example because Austin was only here for a year and Kip has been around forever. But, we can anecdotally tell them that, here's what we see generally about Trevor Bower, who's somewhat of a polarizing figure. Or Danny Salazar or Corey Kluber, who is of course universally liked among our fanbase. Where we listen is, we listen for what our fans say about, for instance, we've undergone a vast renovation to our ballpark over the last three years. So, we report back on what our fans say about that. We report back on, once we employ or roll-out a promotional item, what are our fans saying about that. Or, what are our fans saying day of game about food and beverage and that sort of thing. That's where we use social listening to help inform other departments internally, what their doing and that sort of thing. And then, of course, like I said, we listen to just share the experience of Progressive Field. One of our stated goals is to help distribute or disseminate messages that would show our fans that, "You have to be at Progressive Field, it's a can't miss environment at Progressive Field." So that's what we'll listen for also. Adam: When social was really starting to get traction, a little over a decade ago, the professional sports leagues, MLB being one of them, were very hesitant about what social was going to bring. There were a lot of kind of concerns around copyright and retransmission and, can you tweet play by play? Or is that actually a copyright of the statistics of the game? Obviously, Major League Baseball and everybody has realized that that is not as much of a concern. That this is a wonderful promotional activity. I'd love to hear your thoughts on how that transition has taken place and are there still some things where the league is kind of saying, "Listen you need to be concerned about, you need to be careful about," or an area where they want to have more control? Joel: Yeah, the league, I think you may be aware of this, but with the NAB for instance, essentially does no ... The NBA essentially lets any fan grab video and put it on social. I think that MLB is a little stricter on that. And they view it as copyrighted material. So there's been discussions about that, at least on the MLB level, about how far to take that and that sort of thing. From a club level, we talk about that all the time. In fact, we've had conversations with our rights holder, our TV rights holder, about you have this event, and everybody has a piece of the pie, so how do you not step on each others toes. So, if we're tweeting too much about the game, is that discouraging somebody from ... do I not go to the game because I just need to follow the Indians Twitter account because they're going to show me everything about the game. We've had those conversations. We've had conversations with our TV rights holder, our regional sports network about what is too much to show from an in-game standpoint? And what's taking away from getting people to come to the game and that sort of thing. I don't think it's perfect science. I don't think we'd ever decide to not share something on social because it might take away from somebody watching TV or whatever. It's certainly a fine line because, look, our ultimate goal is to get people to the ballpark and that sort of thing. So that's why we talk about, how do we use social to make those connections, and hopefully get more people to the ballpark through those connections and show what a great atmosphere it is and what a great environment it is. So, we have, it's funny you bring that up, we have these conversations all the time. Like, how do we make this balance, how do we decide what's too much, what's not enough and that sort of thing. I don't think anybody has the 100% right answer, but hopefully we're at a decent mix right now. Adam: One of the things that you and Jay spoke about was how your team, the Indians, are number one. Number one on Twitter, number one on Instagram, in terms of other Major League Baseball teams. And that's just nothing short of phenomenal in terms of your approach and your strategy and what you're doing there. I'm curious if there's anything that you can think of, in terms of how you approach your social strategy, that our listeners could resonate with. I noticed you said you're number one on Twitter, number one on Instagram, not number one on Facebook, but you're killing there too. But is there something about Facebook and the baseball fan, the baseball consumer, that's a little bit different in how you approach it or is it just different platforms [crosstalk 00:30:13] to different types of content. Joel: Yeah we actually… hopefully some of my counterparts from other clubs are listening. So we're number one on those platforms during the season in interaction rate. So, of course, we don't have as many followers as the Yankees, the Cubs, the Dodgers, whatever. But what we look at most importantly is interaction rate. Which is basically strips down for follower size. So we're never going to have as many followers as those teams, but what we do look at is, what percentage of our fans are interacting with us? And so, we're proud of that. Of course, it's a battle to stay on top because so many of our opponents and other MLB teams do a great job there too. We certainly monitor and see how we're doing against those other clubs. As far as content goes, the way I look at it is, Adam, is we try to have different content on different platforms. So, for instance, if I have a story about, oh I don't know, Corey Kluber hosting a Cleveland Clinic children's patient at the ballpark as part of his Kluber's Kids campaign. If I'm a fan of the Indians and I follow the Indians on Instagram, Facebook, Snapchat, and Twitter, and I see the same content on all four of those platforms, I'm going to ask myself, "Why am I checking all four of these accounts because it's the same content." So how I look at it is, I want to tell that story in four different ways. So, that's easier said than done sometimes. With Corey Kluber hosting kids at the ballpark? Okay, so 22 straight wins. So how do we cover 22 straight wins on 4 different platforms? So on Twitter it's a GIF that counts up with uniform numbers to 22. On Facebook it's a native video of Jay Bruce's walk off. On Snapchat it's on field celebration shots and it's following Jay Bruce up the clubhouse tunnel to the clubhouse, showing that behind the scenes stuff. On Instagram it's photos and video, and on Instagram Story it's photos of the walk off. So that's how we approach it. That's not going to be accomplishable or doable for every piece of news or every story we want to cover. But the way I look at it is, and I tell my group that if I follow the Indians on all four platforms, I need to be getting four different sets of content for every story we cover. If not, I'm going to unfollow the Indians on three of those platforms. So say I use Twitter the most, I'm going to unfollow the Indians on those other three platforms, because I'm getting the same content on all four. So if I use Twitter the most I'm going to follow the Indians on Twitter and that's it. We try to accomplish that with everything we do. It's easier said than done sometimes but that's our ultimate goal. Joel: Sorry to interrupt but I'll give you an example. So, again, our radio guy, you guys aren't going to have a clue, but our radio guy broadcaster is beloved here. And we know that fans want to hear big plays with his call. And so we share that across platforms. That's something that is going to perform not matter what. So we're not shy about sharing that across platforms. But a counterpart of ours, in the postseason, essentially posted its Instagram story video on Snapchat. To me that's not good enough for our team. So we try to, so an example of things where we would post same things across platforms, and an example of an instance where we try to not do the same thing across platforms. Because we can do better. Adam: One of the things that fascinates me about baseball and social, and I might be leading the witness here with my last question before I hand it over to Jay, is I believe that baseball is the perfect sport for social media. The pacing, the ability to follow plays, as you articulated Joel, the storytelling. I think it's the best sport for social medial. My question for you is, A, do you agree? I'm going to guess yes. But more importantly, which social platform is really the best one for baseball? Is it Snapchat, like you said? Is it Twitter? Is it Instagram with the jerseys and all that? I'm just curious if you'd say now that's really, really the best channel. Maybe not the best channel in terms of your performance. What's the best channel for telling the story of a baseball game? Joel: So, I think any sport really and I'm sensitive to I go to talk to different groups. I spoke to we spoke to [crosstalk 00:34:52] which is how we got to know you guys a little bit. You go and talk to people who aren't in sports and it's hard because we talk about what our goals are and how we execute and frankly, let's be honest, not all companies have this content we have. So, to me, any sport, if their social staff is doing it right, is great for social. For us, again I know this is probably taking the easy way out, but we see all four of the big four platforms as huge opportunities for us. Because they're different audiences. Twitter, to us, is a customer service platform. It's an engagement platform. It's a fun platform. Facebook, to us, is a connection platform. And this is simplifying it because we do different things on each platform. We do a lot of different things on every platform. But Facebook, for us, is a connection platform. So it's an older demographic. So, how do we connect that group, which has kids, and has probably more disposable income, right? Because they're older. How do we connect them with our players, with our organization, and that sort of thing. Snapchat is a huge point of emphasis for us because we want to get fans connected with us early. So what we do on Snapchat, if you haven't seen us, what we do is we open up our messages and we encourage our fans to use our geofilters and snap them back to us. And we'll put them on our story. It goes back to earlier when a fan of ours tweeted at us, "Oh my god, the Indians liked my Instagram post." Well, we put fans on our Snapchat story that goes out to thousands, and thousands, and thousands of people. And that's cool, right? If I'm a 17 year old kid going to college in Cleveland next year and I see myself on the Indians Snapchat story, I'm going to tell my friends, "You know what? The Indians added me to their Snapchat story, that's pretty darn cool." Instagram is another platform that we feel is a huge growth opportunity for us. It's a cop-out to not answer your question, Adam. But we see all four of the big four as huge opportunities for us and we treat them that. Jay: I think it's great. I think you answered the question by saying, "We don't have a preference." Which is really interesting and I think a fantastic approach. We're going to ask Joel, from the Cleveland Indians, couple more questions here before I wrap it up. But first I want to acknowledge our sponsors, who we would put into our Snapchat story if they snapped us. Adam, you're in charge of this because one of our sponsors is Salesforce Marketing Cloud. 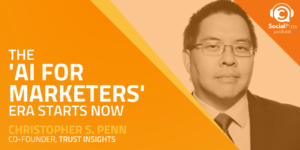 Who have an e-book called, More Than Marketing: Exploring the Five Roles of the New Marketer. It breaks down the five new essential marketing skills that we all must have in order to stay employed in this business. There's interviews in there, there's stories, there's interactive features as well. It's pretty fantastic. As well as immediately actionable steps to mastering these five new talents. You can grab it right now for free, ladies and gentlemen! 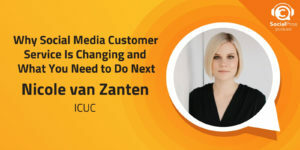 Go to candc.ly/newmarketer. That's candc.ly/newmarketer, all lowercase. Also, a reminder, that our new sister podcast, the Experience This! show is up and running. Unbelievable show, hosted by Dan Gingiss and Joey Coleman. All about the positive side of customer service and customer experience. Companies that are really treating their customers the right way, and inspirational tales, tips and tricks that you can incorporate into your own business. So, if you're not in charge of CX or CS in our organization make sure whoever's in charge of that in your company is listening to the Experience This! show. Because not only will they learn a lot but they'll put a smile on their face. Either look it up iTunes or Stitcher or wherever you get your podcasts. Or go to experiencethisshow.com. Speaking of dot.coms, just a quick reminder that you can get show notes, links, updates, resources, from every single episode of Social Pros, as we near our 300th episode, Adam Brown. All of those shows are at socialpros.com, are featured on the brand new Convince & Convert website. All kinds of cool layout, much easier to use on a mobile. Go to socialpros.com for all our archives. Adam: Joel Hammond, Assistant Director of Communications for the Cleveland Indians, so great to have you on the show. I am sure there are a lot of our listeners, right now, that are thinking, "How the hell do I get a job like Mr. Joel Hammond's?" So I want to ask you, how did you get to this position? And any suggestions or tips for people who want to be just like you, and have such a exciting dynamic job. Notwithstanding the hours that you talked about a little bit earlier. Joel: I took a kind of circuitous route, I went to [crosstalk 00:39:32] first. I went to college. I went to the Harvard of the Midwest, Bowling Green State University, that's what they call it. Adam: I know, I know. Joel: Yep, I went to BGSU. Proud alumnus. I majored in print journalism, so I worked at newspapers there. I worked in newspapers for about nine years after college, in the up-state of South Carolina, which is a beautiful area if you haven't been. And also here in Cleveland. But in 2012 my current boss, who I would speak to about stories about the Indians when I was working in newspapers here. They were looking for somebody and I pitched myself as, "My skills as journalist can translate to your job because I have communication skills, both written, verbally, whatever. And also because I can ..." I pitched myself as basically, when I was journalist I had to develop sources and maintain those relationships. Well, on the other side, on the flip side, I would need to, you know you guys have to create and maintain relationships with reporters and journalists. And so I started here in 2013 and here I am almost at the end of year five. So it's going quick. And I will say guys, I joined the same year as Terry Francona and, if you don't know this, we actually have not had a losing season since Terry and I joined the club. So, it's pretty clear what the difference has been with the Indians. Joel: Well, obviously, obviously. As far as getting started, we're actually undergoing our intern interviews right now. Our internships are generally postgraduate. So, I'll describe the internships first and then as far as other things go. I encourage college students, when I go speak to them, that I need to see real-world experience, in the social space. I get resumes that just say, "My social experience is I have a Twitter account." For us that's not good enough because you have a ton of responsibilities. 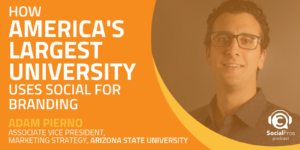 Our applicants show they have experience in social, whether it's volunteering at a company or working for a company in their college town, or whatever. As far as professional hiring, we look for, again, people who can make an impact. We have a pretty lean staff, so we're looking for people to come in and make an impact immediately. Who know our voice, who know what we're trying to do, who love baseball, love the commitment, and that sort of thing. It takes a special breed to work in sports and also to work with us. Again, we have a established voice on social and we do great stuff. We work hard and that's essentially what we're kind of looking for and how I landed here. Hopefully that'll answer your question. Adam: Most definitely. And I think, to that point, and kind of those skill sets and attributes that you're looking for in your interns but you talked about wanting to make sure all of your content has an impact. Has the right voice. That it speaks of those attributes of the Cleveland Indians. And really the on-call nature of everything. I'm curious, for both when you're actually creating, and you're team is creating content, how much of your social content is kind of prepared? Where you've got an editorial calendar, you kind of know, "Here's what we're going to create." Other major announcements, team shuffles, people being called up, sent down. Versus kind of truly extemporaneous, or on the fly. You're actually sitting there, writing the post. There's no approvals. Whether it's you doing it or one of your team members, you just expect them to do it the right way. What's the breakdown and kind of what protocols do you have, if any? Joel: So, the offseason, like we discussed, it allows for a little more making a calendar and timing things out we know when the offseason awards are going to be announced. We know when our 12 Days of Tribe Contest starts. We know when our six-packs go on sale. We know when Tribe Fest tickets go on sale. We know when our Tribe Program begins again for renewal. The offseason allows for a little bit more of scheduling and making sure that we've got a good grasp on what we have coming next. As far as in season goes, we certainly have content prepared. So, for instance, we have a vast GIF library that we have in store and we have those ready to go when our players do great stuff. But in season it's a little bit more on the fly. It's a little bit dependent on what's going on in the sport, what's going on with our team. We can also be nimble, last year we had, I think I mentioned to you guys, we had our first fan voted All-Start starter since 2001. And what that entailed was our players trusting me enough to know that when I asked Franscisco Lindor and Jose Ramirez to put on oversized suit jackets for a remake of CSI Miami, they knew that what I was going to do was going to be awesome. And it was, and Jose ended up our ... I'll tell ya, I asked ... Fransciso Lindor wanted to be at the All-Star game. He wanted to be an All-Star starter. He did not end up being an All-Star starter because Carlos Correa and the Astros got hot and Frankie slumped a little bit. But, I said, "You want to be at the All-Star Game, do you trust me?" And he said, "Yes." And so I told him, "Tomorrow I need 15 minutes of your time," and I told him to watch this CSI Miami clip. And if you know CSI Miami, David, what's that guy's name? David Caruso plays this horrible detective with these cheesy punchlines. And we set up a fake crime scene in our dugout. And we had Jose Ramirez. who doesn't speak any English, or very limited English, and Fransciso Lindor. be detectives on a crime scene. Frankie delivered this great cheesy line about, the vote is in but the jury's still out, and it killed. It was awesome. A lot of that was spur of the moment. Jose and Frankie were our closest guys to All-Star starter spots. This was very important to our organization. To show that our fans could put our guys into those spots. So, look, this was a relationship that I've had since Frankie came up. Do you trust us? Give me 15 minutes. We shot it. It was out a day later and it just killed. A little inside baseball on how stuff like that comes up and how things can pop up sort of on the fly. Yes, you got it. Yep. Jay: I don't understand with your schedule how you've ever seen an episode of CSI Miami, but I appreciate the reference. Joel: I'm sending it to you right now. Cultural touchstone, yeah, I get it. That's great. It's a meme. We'll try and locate that or have you send it to us, we'll put it in the show notes so people can get a glimpse of that piece of content. That'd be awesome. Joel, we're going to ask you, thanks. We're going to ask you the two questions we've asked all guests on this show, now almost 300 episodes. First question is, what one tip would you give somebody who's looking to become a social pro. And of course you do this all the time because you've got interns every year so you get a chance to give them the tip. What would you say to our tens of thousands of listeners to the show. Joel: I would say that my tip follows our stated goals. We have a formal document that outlines our goals and it's to develop advocates for your company, your brand, your team. We have a list of six or seven things through which we go to develop advocates. But if I'm a small business with $50,000 in revenue, or if I'm the Cleveland Indians, I need to develop advocates for my brand, for my team, for my company. How you do that is you set goals and you develop a voice and you stick to that stuff. And you listen to your customers. That's our 30,000 foot goal and that's something that we adhere to. Whether it's December 25th in the morning on Christmas, when we're doing our 12th day of our 12 Days of Tribe Contest or whether it's July 1st and our All-Start Game voting results are out. Jay: I love that idea of it's about creating advocates not necessarily selling something. Last question for you Joel Hammond, and thanks so much for being on the show. It's fantastic. If you could do a Skype call with any living person, who would it be? Bud Selig. Maybe not Bud Selig. Joel: Wow, this is a great question. A Skype call with any living person. Now that's a ... okay. Well, wow, what a great question that is. If I say the President would that be, am I going to get in trouble? I’ll leave the President off. It would probably be LeBron James. I mean, LeBron James is a great basketball player. LeBron James is also a great businessman and great in social media. What does LeBron James have? LeBron James has advocates for LeBron James, LeBron James' brand. Fans who buy his stuff, who buy his pizza, buy his whatever. Buy his shoes, his Beats by Dre. I think LeBron James could give me tips on how do I develop more fans, more advocates, for the Cleveland Indians. Of course, I'm not a world class basketball player, none of us are. But we have a brand that certainly people recognize. So how do I ... how did he get to where he was businesswise, and what lessons can we take from that. I know my wife who actually, it's funny. There's a few stories like this. So the Cavs play right next door to us. My wife works for the Cavs. My counterpart of the Cavs, his wife works for the Indians. Another woman in social, her husband works for the Indians. So, kind of a funny aside to the story. Jay: And they've got fantastic connections, you could probably hook that up, right? You know a guy who knows a guy I suspect. Joel: Funny story guys, last thing, I think I told, well this was in my facts I sent you, I actually tried out for the Cavs D team. Jay: You need a triple date. That's like an insufferable triple date. Everybody's talking about different sports. And hey, you're right, none of us are professional basketball players. But I was the ninth man on the Lake Havasu High School Junior Varsity. So let's not totally sell my skills short. Joel: Team oriented stuff was easier for me. Jay: Yeah, it gives you an appreciation for how good players are, even if they're not at the highest level. Golf's the same way. As I said, one of our team members used to run all the social strategy for the PGA tour, and I'm a big golf fan. I've gone to lots of tournaments and even when you get into the "minor leagues" of professional golf, it's crazy how good people are. It is a very, very, very, challenging way to make a living. Harder than podcast host, I would say. Or executive strategist. Or executive strategist of Salesforce Marketing Cloud, in Adam's case. Joel: Yeah, thanks a lot. Jay: Joel, thanks so much. Congratulations on a fantastic season. A record that may never be broken. At least not for a long, long time. Really, appreciate you taking the time to come on the show. Congrats on all the great work and your number one ranking in interaction rate. Go Tribe. And we'll see you next time. You bet. On behalf of Adam Brown from Salesforce Marketing Cloud, I am Jay Baer founder of Convince & Convert. This has been your favorite podcast, it is Social Pros.